Hargeisa (HAN) May 20, 2014. One of Somaliland opposion officer Yusuf Bodhle the secretary on foreign affairs for the Justice & Welfare party UICID speaking to the press has announced that the US State Department confirmed that the current government headed by incumbent president Ahmed Mohamed Mohamud Silanyo has genuinely accepted the ideology of bringing the greater Somalia together once again. The opposition officer, Bodhle said that the US government is very much contented with that and is now executing the plan to implement the last stage of the plot. Mr. Bodhle was surprised to see the illusions that some of the western government entertain but said is a wishful thinking. 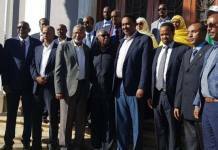 Bodhle scathingly accused the government of Somaliland which is blamed of putting the pen to paper & singing a deal with Somalia for unification. Bodhle said that the arrival of Mogadishu elders to Hargeisa is a true example that Somaliland decision is being derailed. Sources: somaliland informer and UCID Media sources.